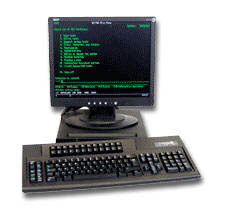 CLI was a leader in the development of unique modular display stations that use virtually any standard PC-type VGA or SVGA color, monochrome or LCD monitor. The CLI 5476, 5477 and 5488 Twinax terminals feature the ergonomics and durability that have made CLI famous. Click here for technical specifications on these models. If your company is looking for an Ethernet connected display station solution, the MT2301 Thin Client Terminal addresses today's conversion of Systems from Twinax/Coax to Ethernet & TCP/IP networks where simple, cost effective, functional solutions are required to address character based terminal requirements. The AG6601 Thin Client Terminal provides dual access to Windows applications and legacy systems (midrange, Mainframe and Unix hosts). The CLI 5476 is completely compatible with IBM 3476 InfoWindow and also includes additional emulations for 3197C and 3197D. The 5476 is only available as a refurbished unit. We offer new 122-key keyboards for all refurbished models. The CLI 5477 is completely compatible with IBM 3477 InfoWindow. The 5477 also includes emulations for, 3197C, 3197D and 3476 InfoWindow. The 5477 is only available as a refurbished unit. The CLI 5488 is compatible with the IBM 3488 which supports Shared-Addressing, the ability to use 4 display sessions while using only 1 host address on the iSeries or AS/400. The CLI 5488V can also emulate IBM 3197C, 3197D, 3486 InfoWindow II, or 3487 InfoWindow II Display Stations. The 5477 is only available as a refurbished unit. Click here or on picture at right for technical specifications on all three models. CLI Modular Display Station is designed for easy Twinax connection to the IBM iSeries, AS/400 and S/3X. With its features and reliability, it is the most cost effective solution in the market. Keeping in mind that this unique modular design also provides real protection of your investment for future migration to PCs and Thin Client Terminals. As with all of CLI's modular display stations, you select from a wide array of keyboard and monitor styles for individual application or user requirements. Whether you need a compact terminal with a 9" monitor and compact keyboard, or a large screen color model, we can provide the proper terminal for your particular requirement. With the built-in System Addressable Parallel Printer Port, you can turn almost any Parallel Printer (laser, matrix, thermal, etc.) into a "Twinax" printer. 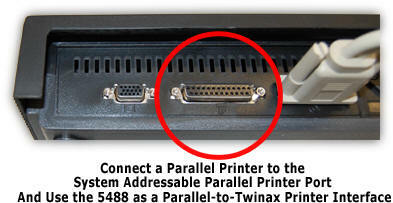 By connecting a Parallel Printer to the the Parallel port and Assigning one of the 7 available Twinax addresses as a Printer Address, your Parallel Printer will act just like a standard Twinax Printer (SCS only). You can even use the 54XX as a standalone Protocol Converter that only uses one Twinax address. All CLI Twinax Modules have this built-in capability - the 5476, 5477 and 5488v. The base logic unit, monitor, and keyboard of CLI modular display stations are separate units, which can be mixed and matched to your requirements. 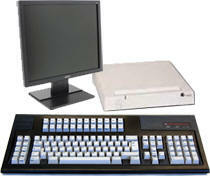 The PC compatible monitor and keyboard can be used by any PC or Thin Client Terminal. The base logic unit can be configured as a stand alone protocol converter to drive your desktop or system printers.